Official Sia Support - How do I download and install Sia-UI? All Categories ​>​ Sia User Guide ​>​ Get Started with Sia ​>​ How do I download and install Sia-UI? Learn how to install Sia-UI on Windows, Linux, or MacOS. A desktop or notebook computer with a decent amount of available storage space. As of April 2019, you need about 15 GB for the Sia blockchain to download. This file will only get larger, so allocate some space to be able to grow with Sia. A basic knowledge of your computer's file structure. Go to our downloads page. You'll see two options, Sia-UI and Sia Daemon. Sia-UI is our user-friendly app, while Sia Daemon is for users comfortable with command-line interfaces. Download Sia-UI for your operating system by clicking the correct OS name. Now either continue straight through to installing on Windows or Linux, or skip ahead to install on MacOS. The process for Windows and Linux is very similar. The result of your download will be an .exe or Linux executable file. Double click it. 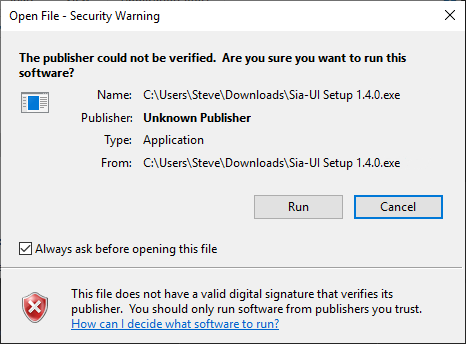 Before Sia-UI launches, you'll likely see a warning that the app is from an unknown publisher. This is standard whenever you try to open an app that is not on your OS developer's approved list. In this case, Sia-UI is from Nebulous, the company the employs the Sia development team. Click Run. Sia-UI will inform you that it's installing. Your computer is going to double check with you about installing Sia-UI. If you see: Do you want to allow this app form an unknown publisher to make changes to your device?, click Yes. Depending on your installed security software, you may also see a warning regarding network access or some other security precaution. In this example Windows Defender is asking if siad.exe, the primary file that Sia uses to operate, is allowed to communicate on the network. Click Allow access. Sia-UI is now ready to go! First time installing? Set up a wallet. The result of your download on MacOS will be a .dmg file, typically in your Downloads folder. Access your Finder and navigate to your Downloads folder to locate it. 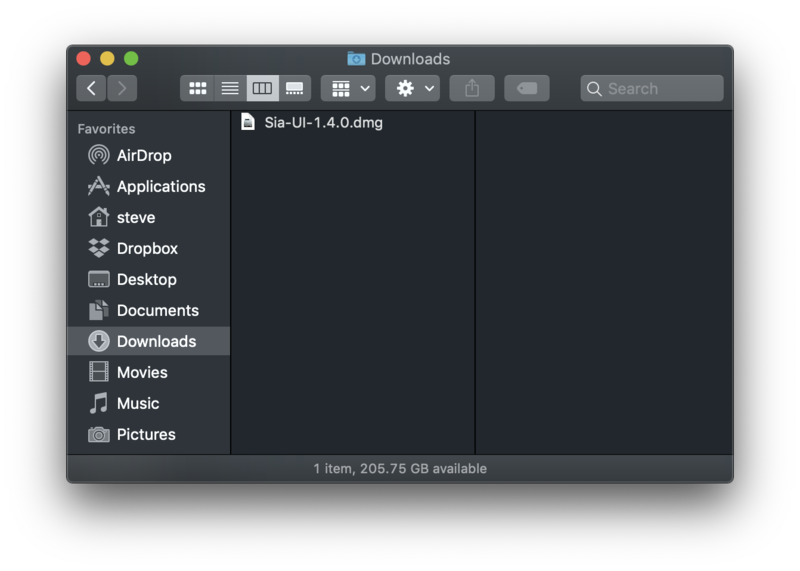 In this example, the file is called Sia-UI-1.4.0.dmg. This can vary depending on the version. Double click on this file to start installation. 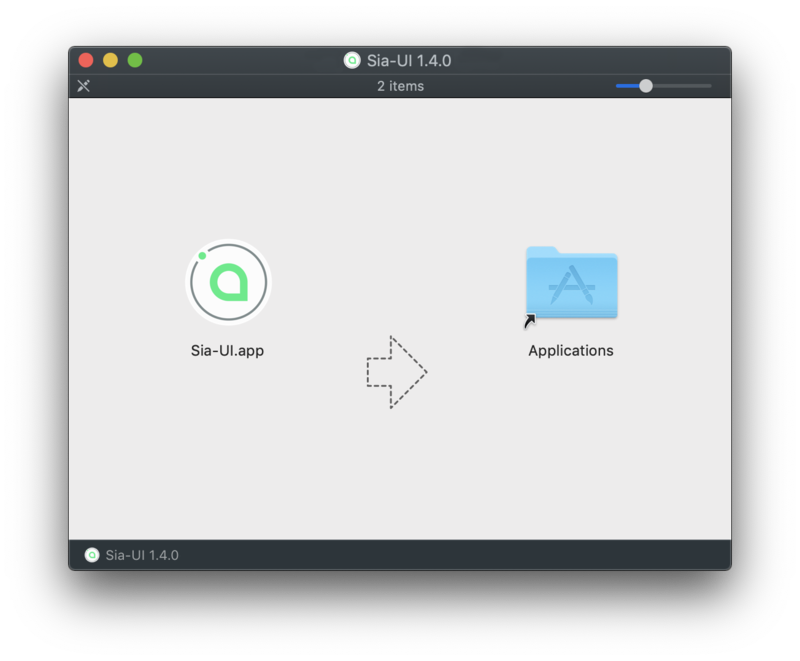 A new window will appear, with the Sia-UI icon, an arrow, and an image of your Applications folder. 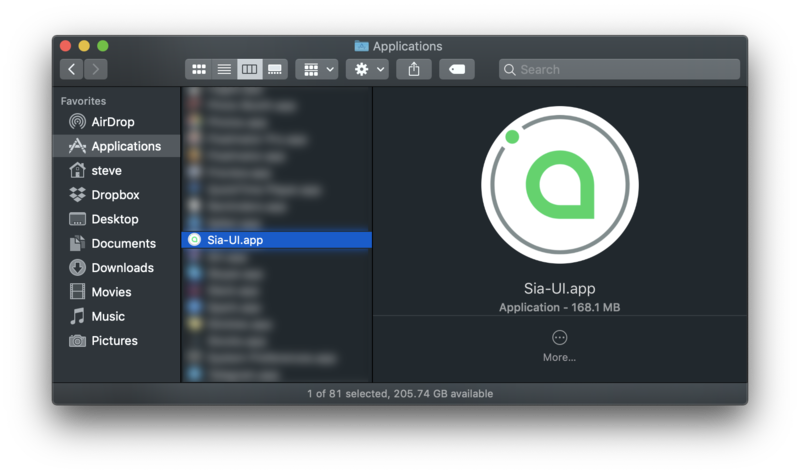 Drag the Sia-UI icon to the Applications folder and let go. Sia-UI has now been installed. NoteTipWarningIf you had another version of Sia-UI previously installed, you'll be asked to overwrite it. It's ok to do this - you're installing the latest version. You can now open your Applications folder from your Finder to locate the app. When you first attempt to open Sia-UI, you'll likely see a warning that you are opening an app from an unidentified developer. This is standard whenever you try to open an app that is not on Apple's approved list. Click OK.
We need to tell your Mac that Sia-UI is safe to run. Navigate to System Preferences, which can be accessed by clicking on the Apple in the upper left corner of your screen. Once there, click on Security and Privacy. This is in the first row of icons. The next screen will open to the General tab, which is exactly where you need to be. Towards the bottom of the window you'll see the message: "Sia-UI was blocked from opening because it is not from an identified developer." Click Open Anyway to the right. You'll then see one more message letting you know that Sia-UI is from an unidentified developer. Click Open. How do I uninstall Sia-UI?